We are living in an infinite ocean of energy and thought forms. On an average a human being generates 60,000 thoughts in a day and does nothing about them. Even when you think you are alone all by yourself , you are actually swimming in an infinite ocean of thought forms. One needs to understand that not every thought is positive in fact most of the thoughts that are created are either infused with fear or just negative emotions. That is how we operate in an auto pilot mode. There is no regulation or check on what we think about ourselves and others. It is crucial to protect yourself from potential psychic attacks. If you are not properly protected from these energies, you can be affected spiritually, mentally, emotional, physically and financially. In some cultures psychic attacks unfortunately are very common . ‘ Evil Eye ‘ etc, nazar…. Negative energy , psychic attacks can affect several aspects of your life in ways that you may not even imagine, and once you become off balance psychically, whether from an attack or otherwise, every part of your life can feel its pain. Luckily, there are ways to protect yourself from psychic attacks to prevent them from messing up your energy and throwing your life off balance.But in order to know how to protect yourself, you must first understand what exactly a psychic attack is. Pranic healing has effective techniques to neutralise a psychic attack and comes in very handy by shielding and protecting the aura /energy body. A psychic attack occurs when someone or something inflicts upon you a negative energy, whether consciously or unconsciously. Why Would Someone or Something Attack You Psychically? You have a jealous friend or family member whose negative energy is projecting onto your life. 10. Emotional fluctuations during the new moon and full moon cycles. There are a lot of ways to get your aura back in shape in order to ward off a psychic attack, as well as prevent these happening in the future. We’ll start by listing the most prominent ways to protect yourself, and then go into details about how to execute each of the individual methods of protection. Pranic Psychic Self Defense course is an excellent course for techniques that help in warding off such attacks but just in case you are yet to do it these are some of the techniques that can be used by you. Crystals are an increasingly common, and incredibly simple way to protect yourself from spiritual attacks. Certain crystals, such as amethyst, rose quartz, tigers eye, and black tourmaline are especially good at repelling negative energy. These crystals can be carried in your pocket or bag, or even worn as jewellery in order to invoke their cleansing and repellent qualities. A good rule of thumb to keep in mind is that darker crystals tend to be better at ridding you of negative energy. Selenite crystal is an awesome one to seal the aura if there are any cracks one can seal the aura visualising the cracks being sealed by selenite the crystal of pure light. A psychic protection kit is your one stop solution to protect your home and office from any psychic contaminations and attacks. This is carefully consecrated and programmed on request to give desirable results. Agate Eyes will bring harmony to your physical, emotional, mental, and spiritual being. This power crystal can be powerfully consecrated and programmed for protection. Salt water is effective in cleansing your energy body take a handful of salt in a liter of water add 10 drops of lavender essential oil and rinse your body with intention of clearing any dirty energy from your aura. Make it a regular bath time ritual and you will observe the many benefits including cleaning up psychic contamination too. Visualisation takes more effort than sage or crystals, but is worth it in the end. Visualisation involves meditating and visualising a protective white light surrounding yourself, your home, and anything else that you feel has been affected in a negative way due to a psychic attack. Visualisations needs to be performed daily in order to maintain the protective shield that they provide, which is why it can be an effort to keep up with. Make cord cutting a daily ritual for keeping yourself from protected from any unwanted energy drain. Praying and chanting can be a great way to invoke protection. Praying and chanting can summon angels that will protect you from dark spiritual entities. PAIN a Symptom or A Cause?? This article is an outcome from a latest conversation within my fellow healers. With every article my own understanding of a subject become deeper , I hope you will like and benefit from it too. Pain is associated with suffering either physical or emotional and as A healer and practitioner of alternative healing techniques this is the most common word I keep hearing from patients. I am in PAIN, I fell down got hurt or I have so and so disease and I am in PAIN, or I was emotionally hurt and I am in PAIN. So we see PAIN can be either physical or emotional :). In this article we explore Are Both These PAIN Different ?? Is Physical Pain a Symptom of an Emotional Pain?? The picture below is a Chinese phrase famous in medicine ,meaning, “If there is free flow, then there is no pain; if there is pain, then there is no free flow” (Tong zhi bu tong; bu tong zhi tong). Interestingly this phrase has a far deeper meaning 🙂 we will explore. Normal physiology says that Qi, or energy, flows through the Meridians the way that blood flows through blood vessels, and these Meridians traverse the entire body to allow Qi to nourish, warm, and activate the various body muscles, tissues, and organs. When that flow is impeded in some way, Qi and blood stagnate in the Meridian, and the body experiences pain along that Meridian – either locally or farther down the stream. This is way bruises are painful; they are essentially stuck blood (and Qi). What causes stagnation in the Meridians? For most pain cases it’s trauma or injury, and this could include things like surgery or overuse. Cold can also cause stagnation. Think of a creek freezing solid in the winter. That’s why we typically don’t recommend icing a strained muscle. Things like stress and emotional constraint also contribute to pain, so have a glass of wine and relax once in a while! Interestingly in the school of energy we understand that we have an etheric body or a the energy double that is also called Aura or bio plasmic field of our body. This body has one to one mapping to our physical body and it has its own energy meridians controlled by energy centers called Chakras. These energy channels or Chakras help distribute prana throughout the energy body and into our physical body. If the meridians in the energy body are clean then the physical body follows the same. The energy body is fed by our thoughts and emotions and hence every physical ailment is related to our emotional wellbeing. There’s no denying that our emotional pains are felt in physical discomfort.Our bodies respond to the pain of our hearts and racing mind. We carry the stress of our lives, literally, on our backs. We get tension when we’re going through stress and have trouble breathing in times of despair and heartache. What Are the Symptoms of Pain? This is only the physical part to pain however being emotional beings we are greatly affected by emotional disturbances within and around us.The feeling and experience of Pain (emotional /physical) is something that is there with us since our birth. Past experiences of painful events reside within us. The accumulation of painful life experience that was not fully faced and accepted in the moment it surfaces and leaves behind an energy form of emotional pain. It comes together with other energy forms from other instances, and so after some years you have a “painbody,” an energy entity consisting of old emotional patterns. This negative emotional body is part of us and when it gets a trigger during times of rejection, break ups, cheating, abandonment,this pain body feels an amplified by the emotion and at times we behave under the influence of this living entity.At that moment, when it does take over your mind, the internal dialogue, which is dysfunctional at the best of times, now becomes the voice of the painbody talking to you internally. Everything it says is deeply colored by the old, painful emotion of the painbody. Every interpretation, everything it says, every judgment about your life, about other people, about a situation you are in, will be totally distorted by the old emotional pain. If you are not there as the space for it, you are identified with the painbody and you believe every negative thought that it is telling you. If you are alone, the painbody will feed on every negative thought that arises, and get more energy. That’s why it’s become active — after it does that for a while, you can’t stop thinking, at night, or whenever it is. The painbody is feeding, and after a few hours, it’s had enough. You feel a little depleted. And then it happens again a few weeks later, or few days later. The painbody loves to feed on actions and reactions and drama is one of the favorite food for it. 🙂 The cornerstone of emotional toxicity is the Pain Body, which prevents you from experiencing peace and connection at an emotional and spiritual level as well as vitality and health at a physical and cellular level. Intersting Pain in this context become the CAUSE. The cells in which past physical or emotional trauma is stored, operate in a survival pattern based on something that is no longer real or current for anyone but the person maintaining the pattern. When an unresolved issue or trauma impedes the flow of energy in the body-mind system, stagnation is created in a particular part of the body, often the organ, joint or muscle most associated with the trauma. We know further that areas of stagnant energy contain negative e-motional charge, dirty energy or diseased energy. A simple example: You hurt your ankle while running because you are late to your office. You feel very upset for that. You get angry at yourself for not paying more attention when walking and you may blame yourself by saying things like, “Stupid, you never pay enough attention!” “You are going to be late and your boss will be upset with you”. By now, your body is not only feeling the physical trauma in the form of real pain, but you are adding self-condemnation, anger, guilt, fear and unforgiveness. This process may go on and on. I have been reading and understanding PAIN through my patients and also through my personal experiences but in the end the realization is that whether PAIN is a CAUSE or a SYMPTOM it does not arise from outside; instead it highlights our own internal weaknesses. There is a famous proverb “NO PAIN , NO GAIN” which I used to always consider in a literal way but today it makes more sense as Pain is actually an instrument for the Soul which if used with awareness and mindfulness can be used for soul mastery. “And another use of pain, a more inner lesson now: for we have reached the point where the Soul has distinguished himself from the body of desire and even from the mind itself. And still he has not got outside the reach of pain, for he has not yet quite found his centre, he is only seeking it still; and although he knows that he is not the body, nor the sense?, nor the mind, he still finds himself susceptible of pain that comes from within, of contacts that translate themselves as pain. And coming into contact with others —-with the thoughts and the feelings and the judgment of others—’he constantly finds himself pained by mis-judgments and mistranslations, by unkind thoughts and unkind feelings; and if the Soul has by this time gained wisdom, as he must have done if he has followed the path along which we have been tracing him, then he will begin to ask himself: Why do I still feel pain? What is there, not in the outside, but in me that gives rise to pain? For he has now passed beyond the ignorance which makes this outer thing appear as the inflicter of pain, and he relates to himself the element that causes pain, and realizes that nothing can touch him save himself, which is in truth responsible for all. So in Truth Pain whether it is a Cause or a Symptom has its own significance in our life either we can heal our self on a superficial level of the pain or we can deep dive and use it for our eternal spiritual growth. 1.Physical Pain is the manifestation of an emotional cause: It is always wise to introspect on the emotional cause for the physical pain instead of working on the symptom understand the emotional cause and work on it. 2.Understand your Pain Body: When in situation of negative self talk, mulling, anger and resentment just detach from the emotion and try to check if you are looking for more drama to fuel the pain body. If Yes then this is a danger ,alarm for introspection. 3. Meditation /Mindfulness: When the pain body engulfs you or you understand it is trying to take over it is best to go a step back and try to see the situation with awareness. The Pain created by your pain body , the drama expected by it to feed itself . Learn a meditation technique or simply sit quietly and revisit the situation in awareness understanding the side effects or the outcome of feeding the pain body. 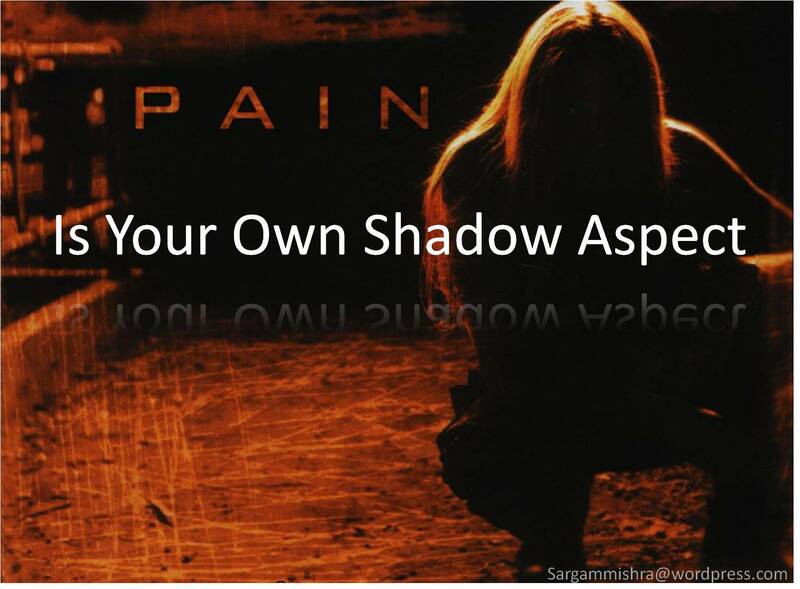 5.Shadow Work: Use situations of Pain as an Opportunity for Improvement: It is hard to hear but learning through Pain is much more faster and hence Pain can be used for understanding our inner weakness to increase our tolerance, to learn forgiveness and to grow emotionally. A useful point to remember is that pain is a protective factor. It warns of danger. It makes one aware of the need to remove a pain-producing potential, such as flame, or scalding water. If it were not for pain, the commonplace dangers of daily life could do irreparable harm to the physical body before the owner was aware of what was happening. And it is this beneficent work of pain that makes one aware of disease in the organism, and so leads to a cure being effected before it is too late. 3. the components of the physical body—maladjustment in organs or cells: blockages in the flow of the life-giving blood. So instead of complaining about Pain try to listen what the Pain is telling you.